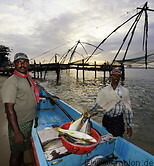 Kochi lies on a number of islands at the northern end of the Kerala backwaters, between the Vembanad lake and the Arabian sea. These islands are connected by a number of bridges and ferries. Kochi does have some decent beaches on its Arabian sea coast. North of the beaches lie the Chinese fishing nets, large nets which local fishermen use to fish by dropping them into the sea and pulling them out after a few minutes.